Home Companies QINGDAO FOCONEC TECHNOLOGIES CO., LTD.
FOCONEC offers rack mount 4RU fiber optic enclosure with modular designed adaptor plates & MTP cassettes (modules). 12 standard adaptor panels or MTP/MPO cassettes could be installed, max accommodate 288 fiber connections. Optical fiber splice trays are optional when splice interconnection or transfer from buffered to jacketed fibers are required. This quick connection enclosures feature front/rear access with hinged panels and sliding-out inner panel for easy, quick installation and management. All adapter plates or MTP cassettes or modules allow easy & quick installation by fasteners (snap-in locker). 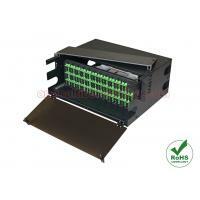 Black powder-coated steel case provides a long-lasting, excellent protection of optical fiber connections.